to support VOLUNTEERISM in 2019! 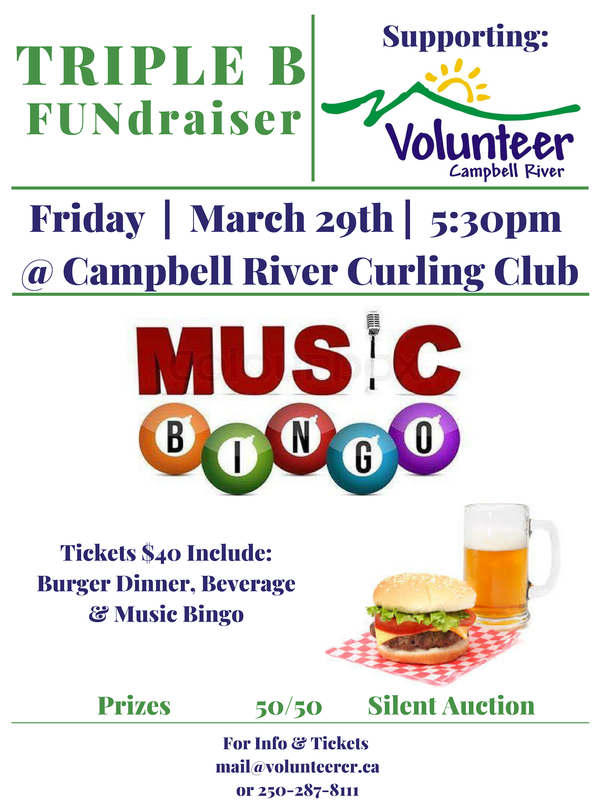 Win door prizes and cash $$$ music bingo game prizes! Enjoy a delicious burger (beef or vegetarian), along with a beer, glass of wine or pop. Take part in the silent auction and 50/50! Bring some friends, sing along to your favourite songs and have fun! Support and celebrate volunteerism in your community! If you would like to sponsor this event, please contact us! Benefits as a Member Agency of Volunteer Campbell River, Join today! Volunteer CR has recognition items available to purchase including “volunteers rock” rocks. We will be working with the community to bring a “Coffee Break for volunteers” during this week. See Wednesday, April 15th Campbell River Mirror for our members thank you to Volunteers and recognition of the Good Deeds nominations and winners. Volunteer Campbell River has partnered with sponsors to provide a free cup of coffee to volunteers during Volunteer Week. A token of appreciation means so much! They are all around us! Generosity happens everyday! Share what you see by submitting a “good deed”! Volunteer Campbell River is excited to announce the launching of the Good Deeds project, with support from the CR Mirror, City of Campbell River and Investors Group. A volunteer will be highlighted in the CR Mirror monthly “Good Deeds” feature spotlight. This will include a picture, the organization that submitted the nomination, and the sharing of their “good deed”. The selected volunteer will receive a gift certificate to their favorite local restaurant as a token of appreciation for the work they do to better our community! The organization that nominated the selected volunteer will receive a $200. Gift Certificate from the CR Mirror for a publicity campaign! A short nomination process consisting of completing three questions is all it takes to nominate a volunteer! Runner-ups will also be highlighted during the National Volunteer Week campaign (deadline of 9 am Monday, March 17th) and in future promotions as space permits. For criteria and nomination forms please click on the links below. If you have further questions, please call 250-287-8111 or email mail@volunteercr.ca. The Good Deeds Project will launch during National Volunteer Week, April 6-12, 2014 and continue until March 2015. Volunteer Campbell River is happy to announce that we will be working in collaboration with Campbell River Family Services to bring the Better at Home Program to our community in 2014! This program will provide non-medical support to seniors, enabling them to live in their homes longer! Preliminary work will start in January with services due to roll out in April 2014 cialis in thailand kaufen.